First flown in May 1958, the Phantom II originally was designed for the US Navy and entered service in 1961. The US Air Force evaluated it (as the F-110A “Spectre”) for close air support, interdiction and counter-air operations and, in 1962, approved an AF version. The USAF’s Phantom II, designated F-4C, made its first flight on May 27, 1963. In its air-to-ground role the F-4 can carry twice the normal bomb load of a WW II B-17 aircraft. The F-4C has a number of differences from the Navy F-4B mainly internal – the radar, radar set group, bomb control system, Inertial Navigation system and the navigation computer. The first production F-4Cs were delivered to the 4453rd Combat Crew Training Wing at MacDill AFB,FL in January 1964, the 12th Tactical Fighter Wing (TFW) became the first combat wing to convert to the F-4C and took them to Cam Rahn Bay AB, South Vietnam in 1965. F-4 production ended in 1979 after over 5,000 had been built, more than 2,600 for the USAF, 1,200 for the Navy and Marine Corp and the rest for Allied foreign nations. 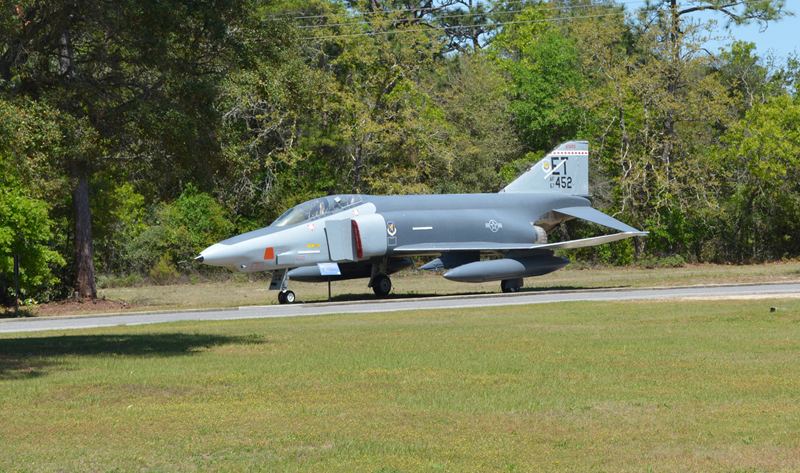 This F-4C S/N 64-0817 was last flown by the 3246th Test Wing at Eglin AFB, FL on 5 May 1986. It was given to the AF Armament Museum for display. It is being depicted as F-4C S/N 64-0813, an aircraft which was assigned to the 12th TFW. This is in tribute to a “tough” aircraft and the first unit to use it in combat.